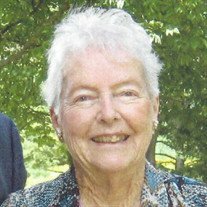 On December 3, 2018, Phyllis Virginia Swann, 87, of Linthicum, Maryland, formerly of Camden, Delaware, passed away at Johns Hopkins Hospital. Phyllis was born on October 8, 1931, in Baltimore, to the late Winifred and John Schultz, Sr. She was a member of the St. Philip Neri choir and active in the Barclay Farms Retirement Community in Camden, DE. Phyllis enjoyed gardening and was an avid Scrabble player. But most of all, she loved being with her family and friends. Phyllis was predeceased by her devoted husband of 52 years, John "Ken" Swann and her dear brother, John M. "Jack" Schultz, Jr. and his wife, Helen "Pat" Schultz. She is survived by her loving sons, Stephen K. Swann, Raymond K. Swann and his wife Marites, Joseph K. Swann, and Michael K. Swann and his wife Laura; her cherished grandchildren, Katelyn V. Swann, Kristen A. Saddler and her husband Jomar, Julia K. Swann, Jacklyn M. Swann, Michael J. Swann and his wife Colleen, Mary E. Swann, Anna L. Swann, and Taylor Rae Swann; her beloved great-grandchildren, Kaleb Saddler, Joseph Saddler, and Kylie Saddler; and her dear niece Peg Schultz and her partner Terri Meehan. The family will receive visitors at Singleton Funeral and Cremation Services, P.A., 1 2nd Ave, S.W. (at Crain Hwy), in Glen Burnie, on Thursday, December 6th, from 3-5 and 7-9 PM. A Mass of Christian Burial will be celebrated on Friday, December 7th, at 9 AM at St. Philip Neri Catholic Church, 6405 S. Orchard Road, Linthicum, MD 21090. Interment Meadowridge Memorial Park. In lieu of flowers, memorial contributions in Phyllis' name may be made to Hosts for Hospitals, 326 Conshohocken St. Rd. #2, Gladwyne, PA 19035 or visit www.hostsforhospitals.org/donate. Singleton Funeral and Cremation Services, P.A. Mass of Christian Burial begins.